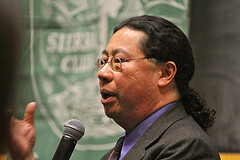 On Monday, March 7, the Sierra Club hosted a well-attended panel in Boulder, featuring Rep. Clare Levy (D-Boulder), Greg Ching, Chief Sustainability Officer of the Solar Gardens Institute (pictured), Paula Connelly of XCEL Energy, and others. Lots of people learned more about community solar - and there are more events to come. Keep your calendars open for the end of April!